Celebration of the Ngerupuk (Mar 30), a day before the Nyepi Day 2014 (Mar 31) in Gianyar County is ascertained to be festive. It followed the issuance of the circular that allowed the making and parading of the ogoh-ogoh or papier mâché demon at the Pengerupukan night. Previously, the customary village youth (Sekaa Taruna) worried if the making and parading of the ogoh-ogoh would be prohibited for the reasons of general election. It is supported by the presence of the circular regarding the celebration of the Nyepi Day in the Saka New Year 1936 No.300/008/BID.II/BKPL/2014 signed by Regional Secretary Gianyar Ida Bagus Gaga Adi Saputra on behalf of the Regent of Gianyar. 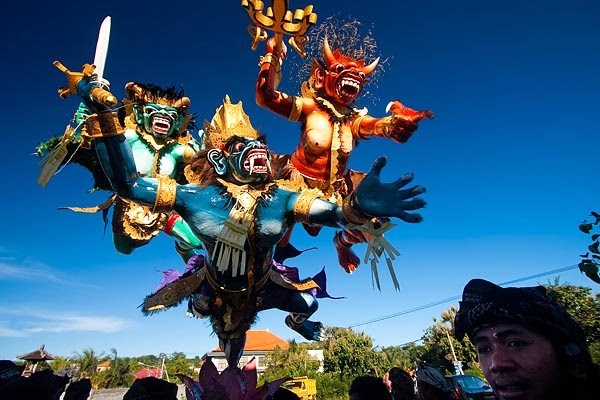 “The making and parading of the ogoh-ogoh must comply with the requirement,” said the Head of Gianyar national unity, politics and public protection agency (Kesbangpollinmas), I Ketut Arthawa. Design or embodiment of the ogoh-ogoh, explained Arthawa, should be adapted to the Hindu literature, and would not be allowed to use the characters or manifestation of the Pandavas, Rama and the like which symbolized goodness. It neither used the characters identifying the attributes associated with politics and political parties, both in the form of ogoh-ogoh or other accompaniment attributes. The ogoh-ogoh parade should only be organized within the territory of respective customary village. Meanwhile, if it would pass through the other customary village territory, it should be made coordination with the officers of the customary village passed or the relevant security force. Besides, the parade should also be accompanied with Balinese gamelan music to reflect the tradition of Balinese art and culture. Then, it would not be allowed to kindle firecrackers or similar items generating booming sounds that could disturb the security and public order. Saputra conveyed the chief of customary village with all the elements of leadership would be fully responsible for the security and order associated with the implementation of the ogoh-ogoh parade. The unregistered ogoh-ogoh would not be allowed to join the ogoh-ogoh parade activities.